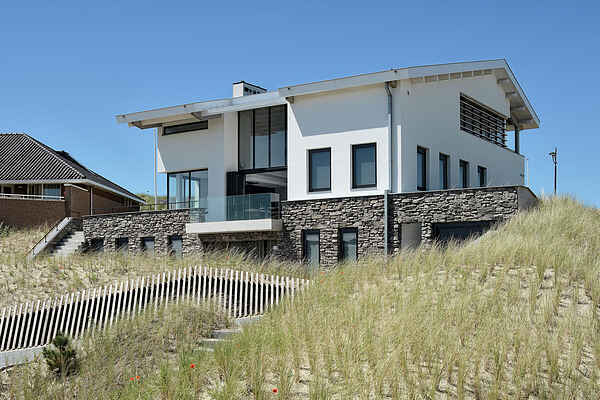 This modern, luxury family villa is set in the dunes of Bergen aan Zee, immediately next to the beach entrance. The villa features two living areas, making it ideal for several families travelling together. This luxury beach house is nicely furnished and features a large living area, a kitchen diner and a comfortably furnished TV room with a variety of board games. The house is surrounded by terraces with outdoor fireplaces, so you can still enjoy the sun on cooler days. There's a bar on the first floor, which is a great place to sit and enjoy the views across the dunes and the sea. In the game room the children can watch films or play table tennis. Although there is a partition of the house, each of the three floors have bedrooms, bathrooms and a seating area. On top of that, there are two fully equipped kitchens. After a day at the beach, the children can walk through the 'washing station' to get rid of the sand. Having a shower doesn't get better than this! The magnificent location in the dunes means it's only a few steps to the North Sea, perfect if you want to go for a quick, refreshing dip. There are many trendy beach pavilions, as well as an aquarium, a bike rental company and fresh bread rolls within walking distance. The vibrant centre of Bergen is only a 15-minute bicycle ride away. The Ruïnekerk church is surrounded by interesting shops and restaurants and during the summer months, the art markets are worth a visit.